One of the blogs I read on a regular basis is Money Saving Mom and today she's coming out with her new ebook, 21 Days to a More Disciplined Life. The ebook grew out of a series she did on her blog, and today, tomorrow, and Thursday, it's only 99 cents. If you have a habit (or several) that you want to add or remove from your life, if you are looking for that extra bit of follow-through, or if you just want to figure out how to take charge of your life a little more, this is a great book to give you a kickstart. There are no magical breakthroughs here, just a simple, methodical way to start changing your life on a basic level. And really, that's the best way to do it - that's the only way it'll stick after all. My best advice to leading a more disciplined life is to take advantage of the little minutes. You know - ten minutes here, eight minutes there. Those minutes add up, but they are so easy to fritter away on the internet or on daydreaming. I try really hard to take advantage of the last five minutes before I leave the house or go to bed - are there dishes I can put to soak? A few things in this room I can pick up and put away? A small piece of a larger project I can complete? Taking advantage of those little minutes means that overall I am achieving my large goals without dedicating an entire weekend day to them. 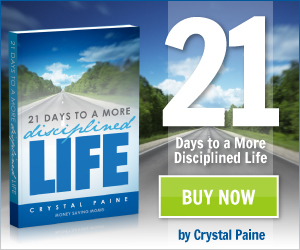 My favorite part of 21 Days are the practical steps included to help you start practicing a more disciplined life - and we all know that practice makes perfect. To help YOU get started with a more disciplined life, I've got copies of the ebook to give away! To enter, leave a comment with your best tip for adding discipline and follow-through to your life. Winners will be announced Wednesday morning. Disclosure: I received a free ebook to review, and this post contains affiliate links. My opinions are my own. I find that making a to do list is not always enough. I try to add deadlines to things on my list to help prioritize what needs to be done. I always work better with a deadline. Great point about deadlines! Email me at littlemissmoneybags at gmail dot com to get your free copy of the book!